Infants are fed and put down for a nap on demand. 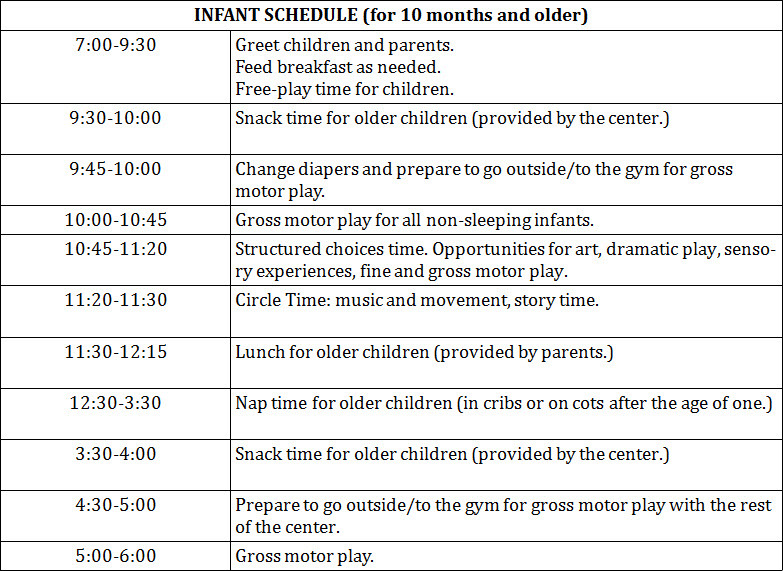 As a child grows they will naturally put themselves on a schedule and we will work with the parents and child to make sure this schedule fits the child’s age and developmental abilities. Caregivers also work to enhance the development of each child at their own pace. The oldest children in the room, approximately ten months and up, work towards this modified toddler schedule to ensure an easy transition from our room to the next. All children in the room participate in the activities of the day if they are awake when the activity occurs (activities include choices time, outside or gym play and story times).